Today, I have found Neo4j and could do nothing but play with it. It looks extremely attractive(for example, for enterprise social data). Neo4j is an open-source, high-performance, enterprise-grade NOSQL graph database. Neo4j stores data in nodes connected by directed, typed relationships with properties on both, also known as a Property Graph. First good news, Neo4j has REST API and .NET client library that is available on NuGet. Let’s download it and reference from our script. Than, we model a twitter data with following and friendship relationships. Let’s define a Person entity, we need to do nothing more than define a new .NET type. We also need to define relationships. Let’s start from following relationship that is simple and does not store any extra data. To define such relationship we need to write new type that inherits Relationship then implement two interfaces which constrain types of source and target entities that can be connected by this relationship. The last step is to define RelationshipTypeKey property that helps us to identify this relationship in graph. We also can define relationship that store any extra data. To do so, we need to create a new class for metadata and pass it into Relationship constructor. So, we are ready to build a graph. Let’s setup a connection to DB and create data. pB |> knows pC "colleagues"
We have built the graph. It’s time to make a query to search something. Neo4j supports a special graph oriented query language – Cypher that looks readable even for analysts, not only for programmers. Neo4jClient has a LINQ-like query builder for Cypher. If you execute this query, you will see a list of followers of “Person A“. It is [“Person B”; “Person C”]. 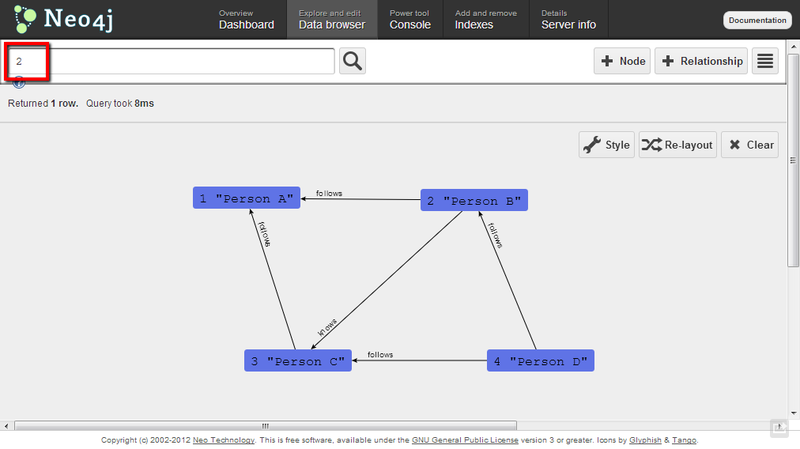 Neo4j has a cool web UI, where you can not only maintain server, but browse, edit and query your data. Let’s open Data Browser tab, click on the Layout button and add a new layout. Here we can define rules for how we want to show entities based on their internal properties values. Please fill the form according to the picture below. 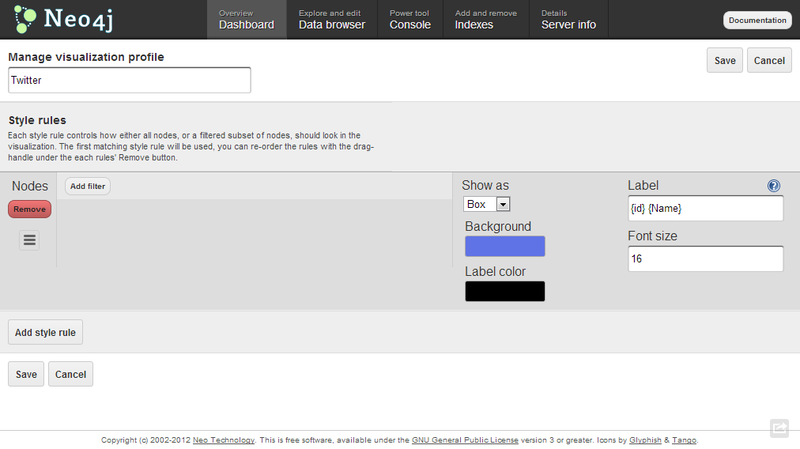 After that save the layout, open Data browse tab one more time and search entity by id 2. You should see the following beautiful graph. “Using Neo4j with F# – Cypher 2.0” is a new version of this demo that is updated to VS2013 and Cypher 2.0. Thanks to Chris Skardon.